As lucrative and promising that investing in Thai Real Estate may be, the eager prospective proprietor has to exercise much prudence and caution as there are many crucial legal aspects that have to be looked into before jumping onto the buy Thai bandwagon. Can you legally own what you are purchasing? Do you fall within the limited exceptions? Is your ‘holding’ vehicle legally tact? What are the legal implications of the form in your ‘usufruct’, ‘superficie’, Thai PLC, etc. in face of adversity? Do you have a Sales & Purchase Agreement? Is your Sales & Purchase Agreement protective enough, or is it lopsided? Is it enforceable? Are there specific tax liabilities involved? Is the House & Land Tax applicable and what is its method of computation? What are the official fees involved in the conveyance? Who is responsible for payment of such fees? Have these been duly conducted by the developer? What are the specific liabilities that may be shouldered by the parties in such specific circumstances? Do you know what you are really buying into behind those enticing promises of ROIs and loose assurances? Know what you are buying. Caveat Emptor! Legal Consultation is strongly recommended for Real Estate transactions in Thailand as there are truly far reaching consequences for taking small steps in err. The Sale & Purchase Agreement (SPA) is fundamental, if not the benchmark to any sale & purchase transaction of real property. The SPA has to be in writing and registered with the Land Office. The property is free of all forms of encumbrances, including mortgages, claims, charges, liens and c.
Notwithstanding these warranties, Property Due Diligence is much emphasized as a legal claim for breach of contract could take years to reach an outcome. It is important to first and foremost appreciate that there is an absence of specific legislation with regards to franchising in Thailand, and much significance is given to the freedom to contract. Despite this general liberty, there are many stringent legal safeguards in place of which must be given thorough consideration. Franchise Agreements have to strictly adhere to Thai law. This dominantly involves compliance with the Thai Unfair Contract Terms Act B.E. 2522 (A.D. 1979) (“UCTA”), the Thai Civil & Commercial Code (“CCC”), the Trade Competition Act B.E. 2542 (A.D. 1999) and the various Thai Intellectual Property legislation. There is an overarching catch-all requirement of ‘fair and reasonable’ in determining if a clause in question is enforceable per Thai law, criterion for exercise of discretion for such determination being contained in Section 10 UCTA. Failure for proper localization may lead to unenforceable clauses, wholly void the agreement and be fatal to the franchise. Patent Licenses are required to be in writing and submitted with the Thai Department of Intellectual Property (“DIP”) and in strict compliance with the Thai Patent Act and in particular the Ministerial Regulation No. 25 (1999) introduced in view of preventing contractual oppression by the party with more bargaining power. Otherwise, such Patent Licenses may be deemed void by virtue of Section 41 of the Thai Patent Act read together with Section 152 of the CCC. Trademark Licenses on the other hand or franchise agreements containing Trademark Licensing provisions similarly need to be in writing and registered with the DIP, pursuant to Section 68 of the Thai Trademark Act. Conversely, Trade Secrets which are similarly commonly intertwined with franchising agreements do not require registration but have to be clearly spelt out in the franchise agreement, embracing specific protection conferred by the Trade Secrets Act B.E. 2534 (A.D. 1991). With respect to local franchisee – foreign franchisor royalties / franchise fees, the tax liabilities are generally 15% Withholding Tax as varied according to applicable double taxation treaties + 7% Value Added Tax + possible Stamp & Import Duties if any. Precise methods of calculation have to be determined to properly discharge these liabilities. The TCA has significant bearing upon Thai Agreements and is of especial importance to franchise agreements. In matters such as price-fixing, confining the franchisee to one or more exclusive suppliers and/or exclusive lines of products and/or geographical exclusion – the TCA may render such terms and to an extreme the Franchise Agreement bad. Trade Competition disputes may be adjudicated at first-instance by the Trade Competition Board. franchisee, the franchisor is handicapped in preventing equipment and inventory that are unique to the franchise from being given to third-party. It is a delicate balancing exercise between the fanchisor’s interests and the franchisee’s rights. Leases (of real property) on the other hand are not automatically assignable unless the lease agreement expressly provides for. It is crucial that a franchisor ensures that franchise-related leases (e.g. retail space) of the franchisee expressly provides authorization from the landlord for assignments back to the franchisor and subsequently to a new franchisee. In absence thereof, in the face of franchisee default – the franchisor is incapacitated from usurping possession of the franchise location. There are 3 main avenues for enforcement in Thailand which are Litigation, Mediation and Arbitration. In the case of a franchise relationship gone sour, parties may seek legal recourse in the form of damages, injunctions, Anton Piller orders, and other legal remedies. Both the DIP and Central Intellectual Property & International Trade Court provide facilities for mediation which has seen notable success in recent years. Similarly, arbitration clauses are recognized and enforceable. Away from the prospect of the lengthy, cumbersome and costly Court process, Thai Alternative Dispute Resolution may be a preferred avenue promising efficacious obtaining of, and effective results. Thailand is a member of over 10 International Free Trade Agreements. An insight into the legal aspects of Thai employment is necessary of course as most business ventures will follow with such need. It is prudent to first note that while the statutory provisions relating to employment are quite typical in nature as compared to other jurisdictions: its application and interpretation by the Thai Courts and labor authorities are well known as tending toward employees. Considering the limited space available here, we shall have to contend to point-form descriptions of some salient points for consideration when hiring. Minimum age for employment in Thailand is 15; if employee is 15-18, additional restrictions apply such as the necessity of informing the labor authority; no maximum age in private sector. No requirement to be in writing; contractual in nature; deemed as ‘Contracts for Hire of Service’. Maximum of 8 hours/ day 48 hours/ week, generally 8.30 a.m – 5.30 p.m with lunch break from 12.00 p.m – 1.00p.m; if work is ‘detrimental to health / safety’, 7 hours/ day 42 hours/ week. Currently (pursuant to Thailand’s Employment Committee No. 6), varying according to province from THB 300/ day (Bangkok, Phuket, Nakorn Pathom, Nonthaburi, Pathum Thani, Samut Prakarn and Samut Sakorn) to THB 222 (Payao); THB 15,000/ month for fresh university graduate (bachelor’s degree). 1 rest day/ week; 1 rest hour/ day; 13 public holidays/ year (which must include National Labor Day 1st May); 6 days paid leave/ year of service; 30 days of paid sick leave/ year (cannot include inability to work due to injury/illness arising out of working, medical certificate can be required if sick leave taken for 3 or more days consecutively, failure to submit of which reasonable explanation must be given. Where 10 or more employees are employed, must be in writing and lodged with Department of Labor Protection & Welfare and a copy must be posted in prominent location at place of work and must include details such as Working Days, Regular Working Hours, Rest Periods, Rules on Overtime and Holiday Work, Procedures for Submission of Grievances, etc. These are mandatory and statutorily codified in the Social Security Act B.E. 2533 (A.D. 1990); rate of 5% (both employer and employee contributes, monthly) on employees’ wages with a cap of 750 THB; tax deductible; provides 7 types of employee benefits including sickness / injury / disability / death not suffered in course of employment, maternity, child welfare, unemployment and old age pension. On the other hand, this fund covers sickness / injury / disability / death suffered in the course of employment; mandatory and statutorily codified in the Workmen’s Compensation Fund Act B.E. 2537 (A.D. 1994); contributions are paid annually; rates being between 0.2% – 1% of the total payroll varying according to the type of business and nature of the work. Employee records and wage payment documentation have to be maintained. Among many other things, these initial requirements are fundamental to Employment in Thailand. Requirements: 2 Mill THB capitalization of Employer Company per Work Permit; 4-1 Thai-foreign employee ratio; and compliance with minimum salary in accordance with the current guidelines. The forum of adjudication for employment disputes is the Labor Court. Labor related complaints and employee grievances may be filed with the Labor Officials which are known to be supportive to employees. The Employment Agreement should be as clear and comprehensive as appropriate as any discrepancy or uncertainty will likely be interpreted in favor of the employee. Please click on below image to enlarge. Please click on above image to enlarge. 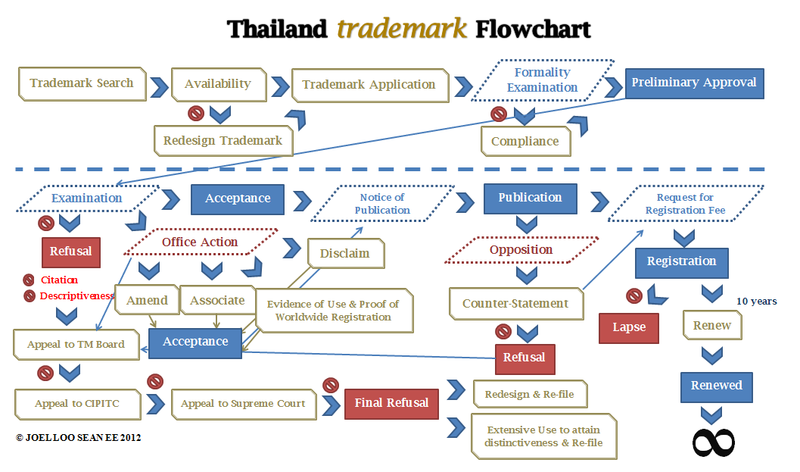 Follow BANGKOK LEGAL BLOG (BLB) for answers to hundreds of questions relating to the Trademark system in Thailand. All written material on BANGKOK LEGAL BLOG (BLB) including this post are the Copyright of Joel Loo Sean Ee. Any attempt to plagiarise or reproduce these materials in whole or in part, in verbatim or in paraphrase, or in any other form that it can be conceivable that such attempt is being made is an offense in law and will be an invitation by offenders to face charges and prosecution in a Court of Law. Please note that the lists below are neither exhaustive nor accurate. The following lists have been provided for reference purposes only as a bare, minimal consolidation of KCP’s readily accessible information at present time. The academic credentials & legal qualifications stated below are limited only to what has been readily accessible. The lists have not been provided for by KCP and is merely the author’s interpretation and recordal of publicly available information. Please view individual profiles here. Limited to primary contacts. Cumulatively, Kelvin Chia Partnership is a team of hundreds of professionals stationed among Kelvin Chia Partnership’s individual offices throughout Asia.